So glad you were rescued from that dog dealer. Now you have a wonderful life with all of the love you deserve. Hi beautiful Minty in The Netherlands! Happy Dog of the Day! Oh, what an amazing, heartwarming rags to riches story is yours, Minty! Endless thanks to all who had a hand in your freedom ride; saving you from that dog dealer's evil clutches; smuggling you safely from Hungary all the way to the Netherlands! You certainly took the long way home, but oh, what a happy last stop it was, into the loving arms of a devoted forever family! How lucky your mom and dad are, having a furkid, a best furry friend as active and energetic, as beautiful and loving, as special as you! You're the poster boy for doggie adoption, Minty, perfect in every way, a treasure! Thanks for the BIG smiles, sweetheart! Reading your inspirational, heartwarming rescue story, seeing your heart-melting photos, has been a real treat! I hope you're enjoying a very special, active and fun filled day of celebration, Minty, taking a nice long walk or a run (depending "which day" this is, mom's or dad's ), chowing down on some yummy treats, cuddling with your humans, being loved and pampered to pieces! Lots of love, cuddles and kisses to you, precious Minty, our very special and most deserving Dog of the Day, EVERY day! Dearest Minty, you are beautiful, an absolutely gorgeous Hungarian-mix boy! You have the sweetest face with that shiny black nose and those lovely big brown eyes. You have the most delightful personality, too. You're super-sweet and wise, athletic and energetic. And what a story you have to tell! We are SO very happy and grateful that you were rescued from those horrible dog-dealers, and we hope the other dogs in that truck were rescued, too. Now you are living the wonderful life you deserve (and always have deserved). You and your dear people all love each other very much, don't you. What a delightful love-filled home you share! 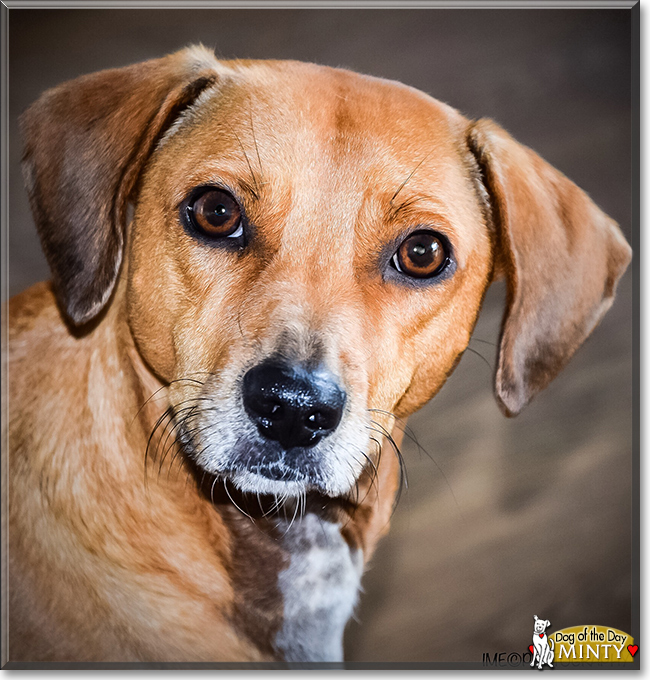 Congratulations, darling Minty, on being chosen today's Dog of the Day! We hope you and your dear people and all your family and friends are enjoying a fine celebration, full of fun and lovies and all your favorite games and treats. Minty is a perfect little dog! Just can't resist that face, those beautiful, intelligent eyes and what an athletic dude too! Minty now leads a wonderful life and we are all so crazy happy he is DOTD! Minty is a beautiful Hungarian mix dog.